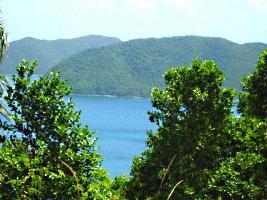 The Virgin Islands physical features are definitely one of the most appealing aspects of the islands. Gorgeous coastlines with white sand beaches, lush, green hillsides sweeping down to the bright turquoise waters, rugged mountains and green plains create a beautiful spectacle for the senses. Each island has its own special character and unique physical features which set it apart and distinguish it from each of the other islands. 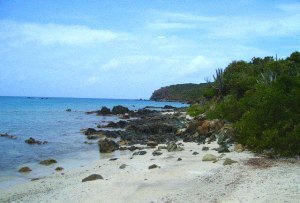 The U.S. Virgin Islands are located at the western edge of the Lesser Antilles chain, and are bounded by the Atlantic Ocean to the North and the Caribbean Sea to the South. They're located roughly forty miles east of Puerto Rico, about 1,100 miles east-southeast of Miami, Florida, and situated at roughly 18 degrees north latitude and 65 degrees west longitude. The islands are volcanic in origin, and are believed to have been formed about 100 million years ago. 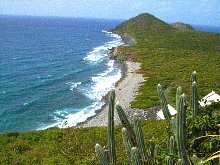 You'll sometimes hear St. Thomas, St. John, and St. Croix called "the three sisters", with St. Croix referred to as the "distant step-sister", since it is less like the other two islands, and farther away from them, than they are from each other. St. Thomas and St. John are just a couple of miles apart, on an east-west orientation, with St. Thomas to the west and St. John to the east. They're also fairly similar to each other in size and terrain. St. Croix, on the other hand, is forty miles south of its two "sisters", and is bigger than the other two islands combined. Its terrain is also distinct, being less extremely hilly, with more flat land as well as a more gently, less sharply contoured coastline.